This week the theme is Freebie. I've decided to go with Top Six Ways Reviewing Books Has Changed How I Read Books. 1. A huge chunk of my free time is now spent reading and reviewing books. This might seem like a no-brainer, but it's worth underlining I think. I read over 230 books last year, and I easily reviewed over 200 for my blog. Even considering how quickly I read, that's still a lot of time spent reading, reviewing and formatting posts. Consequently, I've become *slightly* more picky about which books I pick-up for review, and I'm *much* faster about DNF-ing books now than I was when I started the blog. 2. I've been exposed to a much wider range of publishers and authors than I would have been without writing reviews. From self-publishing authors to small e-publishers to some niche publishing houses I'd never heard of before I started blogging, I've found some really amazing books that I know I would never have been exposed to if I wasn't blogging. 3. I'm reading far less fantasy and way more romance or romance-adjacent books. I used to read a ton of fantasy and urban fantasy, but I've noticed that over the last year, I've shifted more fully into the romance/New Adult genres. Part of this is that there's a greater volume of these books available from the sources I use to get review copies, but I think part of it is also that I read these books faster than fantasy books so my turnaround time is better and that has its own appeal. 4. I've become more aware of small trends in publishing. It's hard to ignore when you read five or six books in a row that deal with a specific topic! 5. I actively look for similarities in book covers. Within the first couple months of book review blogging, I reviewed a book with a very distinct cover, and then noticed another book that came up on Goodreads' First Reads page with the same cover image cropped in a slightly different way. Now I'm always on the lookout for similar/identify cover images or covers that used the same models. 6. I've started to notice repetition in my reviews, which means it's time to shake up my process again. For a while, I was reading with a notebook beside me, but I've strayed from that practice for whatever reason. I think it's time to bring it back so that writing reviews ceases to be such a mechanical process (and the quality of my reviews goes up - hopefully!). 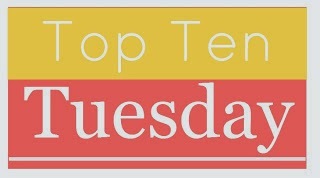 I'm looking forward to checking out everyone else's top ten list this week - I'm curious to see what topics people will come up with! I loved that this week was a freebie week! I'm liking the topic you picked. It is always interesting to actually sit down and think about how big of an impact blogging makes on your reading life and life in general. I too have written reviews that started to seem repetitive so I try to switch up my review style every so often. Do you read others reviews before tackling a book? That's something I had to stop doing. I started noticing it was swaying my feelings toward what I was reading so much that it was hard to digest my own thoughts. Great list! Great choice for freebie week. I used to read a lot of fantasy too but my reading seems to have moved over to YA, like you I think it's because these are quicker to read. I so really want to get back into my fantasy though! I recently made some changes to my review format, just to keep them from being too samey, it's a good thing to do every so often :) Great ideas for your list!